The days in Minneapolis, MN are growing shorter and colder. Is your home ready for another Minnesota winter? Bannochie Builders, Inc. has great exterior remodeling ideas to Increase Energy Efficiency and Add Curb Appeal. Let one of our experienced contractors inspect your home and give you a Free Estimate on replacing your leaky old windows with new energy efficient windows. Other cost saving measures include maintenance free vinyl siding or installing an energy-conserving roof that will protect your home for many years. Installing new energy efficient windows can Dramatically Reduce Heating and Cooling Costs in your home. We offer a variety of windows that will look great while increasing energy efficiency. Our experienced contractors pay close attention to detail to ensure that the windows you choose are installed correctly and will bring added curb appeal. Modern Vinyl Siding is virtually maintenance free and elevates your home’s energy efficiency. Bannochie Builders installs a high-grade vinyl siding that works to protect your home from the elements while you stay warm and dry inside. The dual layer of protection offers a barrier to winter weather and deflects the summer sun. Your home will have abundant added curb appeal and increased energy efficiency with our professionally installed, high quality vinyl siding. We will make sure that your home has proper insulation and cover it with long lasting and durable vinyl siding. Installing a new roof provides the ultimate protection from our extreme climate. Your roof protects against snow, rain, wind and hail. A professionally installed roof also provides Energy Conservation. Proper insulation, venting and flashing are key elements for increased energy efficiency and a polished new roof. 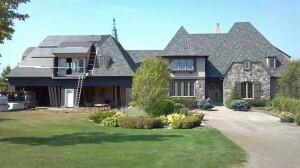 Our licensed contractors are very experienced in the installation of all types of roofs in Minneapolis, MN. See how Bannochie Builders, Inc. can Maximize Curb Appeal while Increasing Energy Efficiency. We have been helping Minneapolis, MN homeowners to lower energy costs and add comfort and value to their homes since 1995. We are trusted and respected home improvement professionals. Bannochie Builders, Inc. are an Experienced, Licensed, Bonded and Insured, Professional Contractor. Contact us today for a Free Estimate on your Home Remodeling projects. This entry was posted	on Thursday, October 30th, 2014 at 6:52 pm	and is filed under Home Remodeling. You can follow any responses to this entry through the RSS 2.0 feed. You can leave a response, or trackback from your own site.